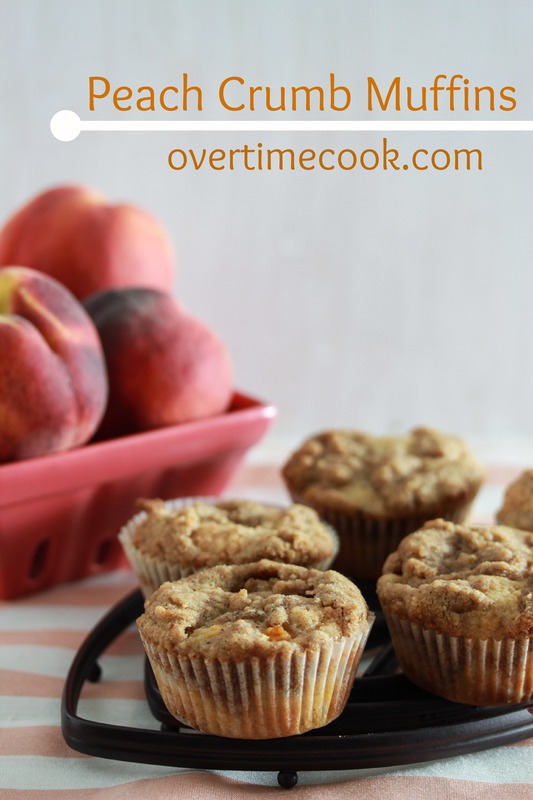 Hold on to summer with these delicious muffins – loaded with peaches, brown sugar and cinnamon, then topped with delicious crumbs! Where, might I ask, has the summer gone? Am I the only one who gets all panicky when the summer starts winding down? Did I do enough? Did I enjoy it enough? Did I eat all the right produce, have all the right barbecues, bask in the right sun? WIll I hang on to this warmth in a couple of months from now, when I’m struggling to stay warm through the cold New York winter? I don’t know. I guess there’s never enough of such good things. Like summer peaches. How delicious are they? And you have to admit that nothing in January will compare to the juiciness of them. So if you want to hold on to the fabulousness of summer, and of course, peaches, make sure to pick some up now. And then bake these muffins. They are, quite simply, amazing. Preheat oven to 350ºF. Line 2 muffin pans with paper liners and set aside. In a large mixing bowl, whisk together flour, sugar, brown sugar, cinnamon, and baking powder. Add eggs, oil, whipped topping, and vanilla. Stir until all ingredients are incorporated. The batter will be very thick. Gently stir in the diced peaches until evenly distributed. Prepare the topping. Combine all ingredients in a small bowl. Stir until smooth. The crumbs will be very wet and thick. Fill the prepared muffin tins 3/4s full with batter. Cover the top with a layer of crumbs. Bake for 20 minutes. sounds so yummy! did you try freezing them? Btw, a tip for peeling peaches easily: Keep a small pot of boiling water on the stovetop. While it’s simmering, dump in peaches for 10 seconds. Rinse under cold running water and the skins will slip off like magic! I just did this when I made a peach compote and wow, it works wonders! Also, in regard to the non-dairy whipped topping, can I use milk instead? Does the topping need to be whipped beforehand? You can use milk or cream. It does not need to be whipped! do you use rich whip as your non dairy creamer? I feel the same way about summer – it goes too fast for sure! I just bought peaches at the local beach farmers market – may need to go back and get more those this recipe! Pretty shot! This sounds right up my alley. Can they be frozen? I just made them. 20 minutes of bake time is not enough. A toothpick inserted in the center of the cupcake comes out very wet after 20 minutes. These have to bake longer than that. That’s probably because you subbed milk, instead of cream, for the whip, which has a thicker texture than milk. Oh, so that’s why! Thanks! These look amazing! I love cinnamon anything in the morning, and I’m looking forward to trying this flavor combo with the peaches and brown sugar. Thanks for sharing. Any suggestions or tips for storage? I made half a recipe of these so I got 12. It was way too much to eat in one binge so I put the rest on the counter for the next day. The crust got un-crispy pretty soon and the bottom got oily/soggy. After 2 days I put them in the fridge and it didn’t help matters. I can’t imagine freezing would have worked better. I kept them in a clear plastic container, the kind they sell muffins in. These look amazing, but I don’t have any peaches. Do you think I could use a different fruit instead, plums, maybe? I think any stone fruits – plum, nectarine, etc, would work nicely!